For the most part, real estate agents request a 6% realtor fee from every sale. For some sellers, that number seems daunting: a $234,000 sale makes the seller’s agent $14,040. They see the number as excessive and resolve to negotiate the commission down by one or two percentage points. Here’s the thing though, your real estate agent doesn’t get that $14,000 to put towards a Maserati or a Key West vacation home. The 6% percent that realtors earn goes towards giving you an incredible home selling experience. Realtors spend their fees on marketing your house: they contract out top of the line photographers for professional interior and exterior shots, they advertise your home online, they even get video footage taken so buyers can experience your home from their living room couch. We wanted to know exactly where all of your hard earned cash goes, though, so we did extensive research and talked to a top real estate agent. We learned to trust the real estate agent when she says she needs a 6% cut because the portion of the commission that ends up in her pocket isn’t as big and flashy as we thought. But is it worth paying the entire 6% real estate agent commission? You bet, and here’s why. 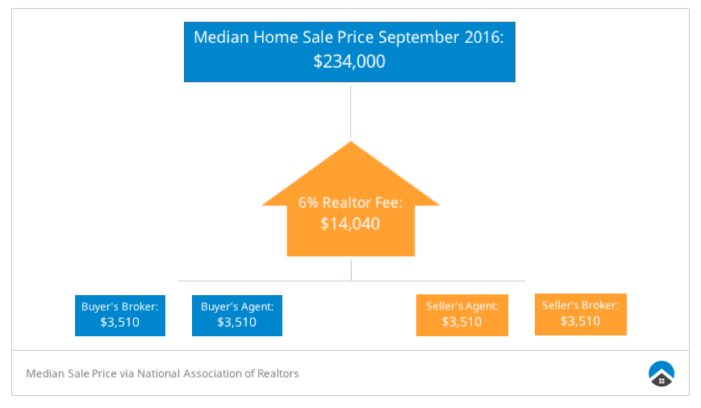 What is a Realtor Fee? A realtor fee is the way a real estate agent makes money off of a home sale. Most real estate agents charge 6% of the sales price as their commission. The 6% goes to the seller’s agent, and the seller’s agent gives half of that 6% to the buyer’s agent. Then, the sellers agent splits their 3% take with their real estate broker. Unfortunately, your amazing seller’s agent doesn’t get to keep her entire commission. Think about the realtor fee this way: if you paid any less than 6%, your realtor would wind up with either no cash to advertise your place or no takeaway pay. Neither situation is ideal. Your seller’s agent takes away 1.5% of the money your home sold for. The median price of a home sale in September 2016 was $234,000, according to the National Association of Realtors, so that means your real estate agent gets $3,510 out of the average American home sale. That’s not quite the $14,000 we originally thought. 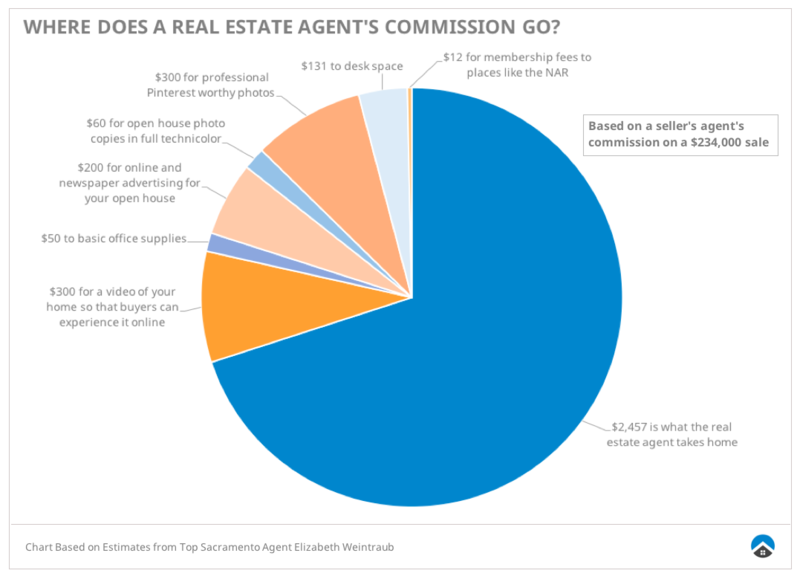 Where Does A Realtor’s Commission Go? We interviewed Elizabeth Weintraub, a seller’s agent in the top 1% of agents in Sacramento, CA, to understand where the agent commission really goes. Out of the 1.5% of the sale the real estate agent is left with, Elizabeth uses 30% towards marketing costs for the property. At the end of the day, a big chunk of her real estate agent fee goes to marketing your house with only the best photographs, full color online and newspaper ads, or a creative email blast to generate activity at an open house. That realtor fee makes your home look like the best, biggest chocolate cupcake in a box of 12 identical pastries. Every kid wants that cupcake. Your agent uses her 6% so that every buyer wants your house. If we take the median home sale price for September ($234,000), here’s a breakdown in dollars of where the 6% most often goes. Discount brokers can’t afford to do the right kind of real estate marketing on that scale. A discount broker could spend the same amount on marketing as Weintraub does, but what takes 30%of her commission would be 70% of theirs. Real estate brokers who charge a discounted rate might make you pay less, but your photos on the MLS could end up as dark, blurry, vertical iPhone shots. Are those the pictures you want on your open house flier? Elizabeth shared a story with us about a time when a client chose a low cost brokerage company over her because he would have to pay less of a realtor fee. The client’s house did not sell with the company that promised a lower commission rate. Was hiring a real estate agent purely for their low realtor fee worth it? Absolutely not. Are Discount Real Estate Brokerages With Low Fees or FSBO Sales Off the Table? The cash might seem like a lot, but the numbers show that you stand to make more with a real estate agent than if you were to sell your home by yourself. Though selling For Sale By Owner could lose you money, discount brokerages aren’t all bad. According to Elizabeth, some clients don’t need the full service real estate agent experience. If you’re selling a cookie cutter condo with the same amenities, square footage, wear and tear, and price tag as six of the other properties in your neighborhood, you won’t need much pizazz put into your listing. A discount broker could be great for a client looking for a quick and dirty, straightforward sale where they know that their place will sell for the same as other comps, and nothing more. Sure, but do your research first. That 6% breaks down differently in every city across the US because homes sell for different median rates across the country. In some cities the commission breaks out into just over $10 an hour, while in California the daily rate can reach upwards of $224. Cutting an agent’s commission reduces the great work they can do to market your property, and in some cities negotiating down could cut it out all together. An agent charges a 6% realtor fee so that they can market your home and negotiate a killer deal. At the end of the day you should pick an agent because they are compatible with your personality, your schedule, and the stats on their profile show that they are going to do amazing work. As Elizabeth showed us, choosing an agent based on a low fee can backfire. The real estate agent commission pays for the marketing that gets your home sold. Professional interior and aerial photography, ads in newspapers and online, email campaigns, and open house flyers all come out of pocket for your agent. Pay the realtor fee they need to ensure that you get the best real estate marketing experience possible. Thought the real estate agent commission was all for the agent? In reality, a big portion of it goes right back to you.